There is an actual Latimer House in Queens, which has nothing to do with this band but could make perfect sense in the ragtag collection of influences from around the world on this single. Latimer House is based in the Czech republic with members from Toronto, London, Baku and Virginia combining a jangle English pop with a serious post punk slant. 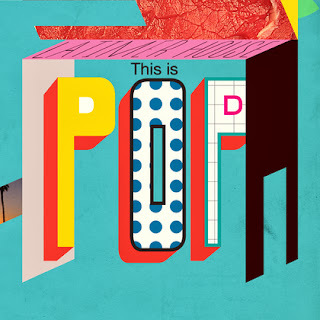 "This is Pop" on the A-Side has the a super jangle of a real textbook English sound and Joe Cook's baritone vocal like Eddie Argos of Art Brut is delivering things in a suave cabaret style by declaring 'This is Pop' in the same sentence as processed meat. Post rock, loose jangle guitar and these drums are mic'd perfectly for this stuff. Loose and cranked they've jabbed the mics up in those cavities where you get every ricochet off the sticks and the hiss of high hats. The guitar is loud an clipped following along but getting distracted along the way. Wandering down the street distracted by nearly everything in those windows, nothing is that important, not even this song. Joe's cleverly meandering this vocal right along with these window shopping riffs. It's fast and pop, all catchy but still with that dopey half awake style. Not a stoned surf, but a winking pop that knows it's just on the border of not being pop at all. That heavy English aesthetic has always been able to get away an adult twee sound, where you can have that tongue in cheek pop that isn't threatening but still sharply skewers those everyday targets. I didn't even hear this organ supporting this live unrehearsed sound that's just together enough to be serious. B-Side's "Shake" has a slow picked opening with a mandolin that meanders in over that high lofty melody. Weird jabs at an organ over Joe's vocals that are hugely delayed in this jangle psych track that repeats "SHAKE!" in an increasingly manic way. Like early REM or The Psychedelic Furs there's echos of that time, the seemingly simple tracks, a perfect B-Side that delivers an entirely new facet of these guys that probably wouldn't end up on the full length or be as catchy to distract from that brash and confident A-Side. Here's reversed loop weirdness that could eventully take the place of your love for that A-Side but it's going to work harder to get there. It's ones like these that always creep up on you without even knowing it. Turquoise vinyl on their own Honk Records. Import from the band's site.